Perhaps I should say this paradigm shift is resuming. The healthier incoming paradigm is a modern, more accurate, better-supported, and better-understood version of one that began the shift towards a free, healthy, and prosperous world more than three centuries ago and which informed the creation of the United States itself: Classical Liberalism . Paradigms determine how we see and feel about the world and are far more powerful than even the most detailed artificial VR  simulations. Compared to the OASIS of Ready Player One , for instance, a wide-ranging paradigm can have more emotional punch and more power to warp perception. A paradigm may not change what you see visually, but it can dramatically change what you think and feel about what you are seeing. A paradigm can change your actions relative to what you see and hear; it can change what you expect in the future and how you respond to those expectations; it can change your view of people you meet and your responses to them. For example, dogs and cats do not appear to hear music. They hear noise, of course; their hearing is generally better than a human's and so the sound of music coming from your car stereo, say, is picked up by your pet's (probably) keen ears and transmitted to its brain. But what happens next? In humans, the sound of, let's say, Harry Gregson-Williams' Life from the soundtrack  to Prometheus  creates something more than an awareness of sound: it creates music, which is to say it creates, among other things, an emotional response. The response varies depending on the person, the person's mood, the genre of music, and many other things, but it is this power to connect with us emotionally that draws humans to music and which makes music an important part of our lives. "Without music, life would be a mistake" – said that old virtual-reality master Friederich Nietzsche , and it isn't hard to understand why he felt that way. Sound is the vibration of air, picked up by one's ears and fed to one's brain, but music is more; music is created in the brain (of a person) from the raw material of sound-awareness. Spindle cells  (spindle neurons) are, or so I surmise, the biological structures responsible for that miracle, for turning mere sound into breath-taking art and toe-tapping rhythm and a sometimes awe-inspiring depth of feeling. Spindle cells are direct pathways from the brain centers that process incoming sound (and more) to those regions associated with deep feeling, and only a tiny handful of species are known to have these cells – humans have small numbers of spindle cells (a few thousand), some other primates have even smaller numbers (by a factor of perhaps 10) of spindle cells, and elephants and some cetaceans – some dolphin and whale species – are also known to have spindle cells. All the facts in the world will not sway someone to an understanding of (for example) liberty, UNLESS that person also has a framework that makes proper (accurate) sense of the facts. Without the framework, the facts are just noise. Without the framework, new facts obfuscate rather than clarify. Without the framework, communication (from an abolitionist , say) cannot happen, just as The Rolling Stones cannot communicate with Zoomer: Zoomer lacks the brain hardware to convert sound into music, just as your friends lack the paradigm to turn the ten thousand news items and other relevant facts they hear about the DrugWar into a sensible response to those facts. "But if we just let people DO WHATEVER THEY WANT, wouldn't that cause ANARCHY?" That and other pre-programmed responses stop the truth (i.e., a more accurate interpretation of events) from ever making it into consciousness for most people. Paradigms are generally thought of as intellectual in nature, but the desperate maneuvers people make to hang onto their existing paradigms – no matter how badly a paradigm fits the facts and no matter how much harm it causes – show that feelings and emotions  are important components. This is true even when the paradigm appears, superficially at least, to involve nothing but cold mathematics and careful, scientific measurement. Again, those unfortunates who were tortured and murdered for espousing new scientific ideas a few centuries ago are perfect examples. The most important paradigms today – political paradigms, in particular – are visibly based largely on emotion and feeling , not on science or facts. Addressing this emotional component is critical if we are to encourage the needed paradigm shifts in the world at large. More on this shortly. Is it realistic to believe that the paradigm of coercive Statism – deeply entrenched and not merely promoted but actually enforced (that IS the correct word) by the power elite – can be displaced by a different paradigm? In a word, yes. The power elite are fighting to keep the coercive Statist paradigm dominant as if their power, wealth, and even their lives depended on the outcome, but, as Victor Hugo  pointed out, nothing can stop an idea whose time has come. And the time HAS come, at last, for mankind to wake up to the con of coercive Statism and, in doing so, end the nightmare imposed upon us for so long. Or perhaps I should say this paradigm shift is resuming. The healthier incoming paradigm is a modern, more accurate, better-supported, and better-understood version of one that began the shift towards a free, healthy, and prosperous world more than three centuries ago and which informed the creation of the United States itself: Classical Liberalism . More on that paradigm, its weaknesses, and the improved modern version of it, later in the column. A good fictional and symbolic illustration of how powerful and pervasive the coercive Statist paradigm is can be found in the 1988 science fiction film They Live , just released on Blu-Ray . A resistance group has made special sunglasses which let people see Earth's psychopathic alien overlords for the bizarre-looking creatures they are (without the glasses, the overlords look like normal people). The glasses also reveal subliminal messages (such as Obey) embedded in magazines, newspapers, advertising, and on television. Adopting The Doctrine of Love and Freedom is like putting on a pair of those sunglasses: the world suddenly looks different. Propaganda shows up everywhere; otherwise-intelligent people are seen to behave in foolishly destructive ways and to advocate bizarre views of the world. And the coercive elite, the aristocrats of the Statist realm? They seem a lot less attractive and benign than they did before. There are several names we might use for the anti-freedom, anti-compassion Statist paradigm, including Coercive Statism, Left-Right Statism, or simply Left-Right. Whatever we call it, this paradigm is clearly incompatible with healthy, civil society because aggression and violence are built-in, natural market protections are eliminated (a more horrific  problem than you might think; see also here ), connected corporations and other favored groups and individuals get preferential treatment, often including subsidies (directly and otherwise) taken from everyone else, and coercive limits on both liberty  and compassion  are seen as acceptable. The very fact that liberty and compassion are not seen as a mutually-supportive duality is itself a danger. If we want a healthier, more civil society, we will need to find and embrace a paradigm more in harmony with healthy human nature. A concerted and shockingly deceptive effort to associate coercive State power with compassion long ago eroded understanding of and support for Classical Liberalism's compassionate elements and eventually came to dominate thinking in the United States and throughout the West. Government had somehow become an agent of kindness and compassion and all that is good in the world – or so the new framework proclaimed. (Putting the sunglasses on, one might note the two hundred sixty-two million murders  governments committed around the world in the 20th Century – in addition to war dead – which again shows the staggering power of paradigms to alter perception. Coercive government, an agency of compassion? It is mind-boggling that millions of otherwise-intelligent people could be made to believe such a lie about the most violent and murderous institution to ever exist, but again: that's the power of paradigms). * A republic or other mostly-uncorrupt government is formed (this actually being the first assault on a free, Stateless people  in times long past), with the government small and largely run by and answerable to the people (to be clear: yes, most governments have not been so benign even at their beginning). Honest money is used, with gold, silver, and copper coins being the main forms of currency. Taxation is low; government intrusion in both business and personal life is low to non-existent, and the people are industrious, virtuous, and increasingly prosperous. Classical Liberals of the 1700s and 1800s seemed to understand this – often quite passionately – but, again, they understood it vaguely and without the detail and scientific support possible today. (Not to mention that Jefferson and a number of other prominent Classical Liberals were actual slave-owners; the reconciliation of two opposites – freedom and human slavery, in the minds of America's Southern gentry – is yet another example of how powerful and bizarre paradigms can be in warping thought, perception, and action.) And most definitions of Classical Liberalism include minarchy , usually in the form of a limited constitutional government. Here in 21st Century America, we know how THAT turns out. Our limited, constitutional government has become a vast, bankrupt empire and a dangerous and intrusive police state. Those who want more material about this paradigm will have no trouble finding it. This will be the one-hundredth column I have posted at Strike-the-Root.com  since 2002 and almost all* of those columns describe, in one fashion or another, some part of the paradigm I advocate here. My writings also include many links and references. Any major paradigm encompasses far more than the one or two elements that get top billing; I have done what I can to provide a wide range of relevant fact, theory, prediction, example, and other details that, together, should bring The Doctrine of Love and Freedom** to life for anyone interested. ** I call this paradigm by several names in addition to The Doctrine of Love and Freedom , including Neo-Classical Liberalism and, in a 2005 book and its companion website , The Paradise Paradigm . For now, let me start with what this paradigm is not: It is not mere libertarianism or anarchism or voluntaryism or any other framework that describes a purely political idea, including the idea of completely eliminating the State and its systematic aggression. I call that idea abolitionism  and I favor it strongly, but abolition of the coercive State is not enough – not nearly enough. While working for that society-wide improvement, individual lives are also improved, and that, too, is hugely important. Having freedom isn't enough if you are emotionally repressed, unhappy, and miserable inside – and badly-treated children ARE repressed, unhappy, and miserable inside – even as adults – no matter what the political and social climate is like around them. See the stunning ACE study  [PDF] for a powerful look at the ways early experience affects later life. For a long page with more information on the sensitive dependence on early conditions (both good and bad) in human life, with links to many scientific studies and articles about studies, see http://paradise-paradigm.net/science.htm . It cannot be said too often: Freedom alone is NOT enough. For more detail, including discussion of and links to relevant scientific studies and other corroborating material, please see The Paradise Paradigm (which includes several chapters on the scientific underpinnings of the framework) and my archive at STR. 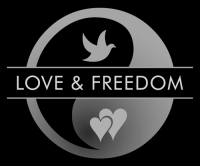 Section 7 (titled "Links, references, examples, and further reading" near the bottom of The Doctrine of Love and Freedom  is a good place to start.